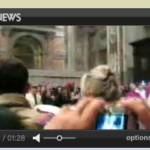 A woman, apparently deranged, charged at Pope Benedict during the entrance processional at Christmas Eve Mass at St. Peter’s Basilica, knocking down the Holy Father and Cardinal Roger Etchegaray. Pope Benedict, apparently uninjured, got up and celebrated the Mass; Cardinal Etchegaray, the 87-year-old vice dean of the College of Cardinals, was taken to an emergency room for a broken leg. The woman who leapt at Pope Benedict XVI during midnight Mass at St. Peter’s basilica on Christmas Eve is being held in a psychiatric facility in Rome, while Vatican officials weigh their legal options.